From the introduction: Usage-based pricing has rapidly become one of the most high-profile topics in Internet policy. 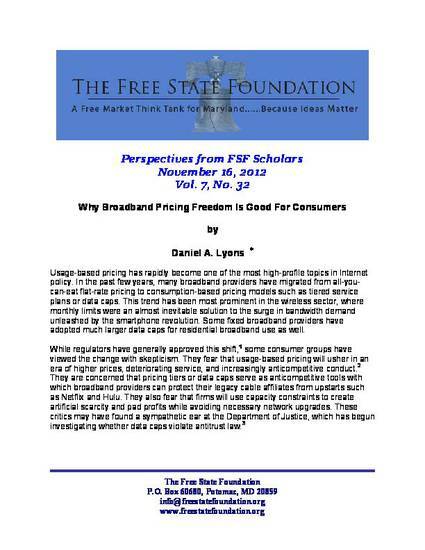 In the past few years, many broadband providers have migrated from all-you-can-eat flat-rate pricing to consumption-based pricing models such as tiered service plans or data caps. This trend has been most prominent in the wireless sector, where monthly limits were an almost inevitable solution to the surge in bandwidth demand unleashed by the smartphone revolution. Some fixed broadband providers have adopted much larger data caps for residential broadband use as well.